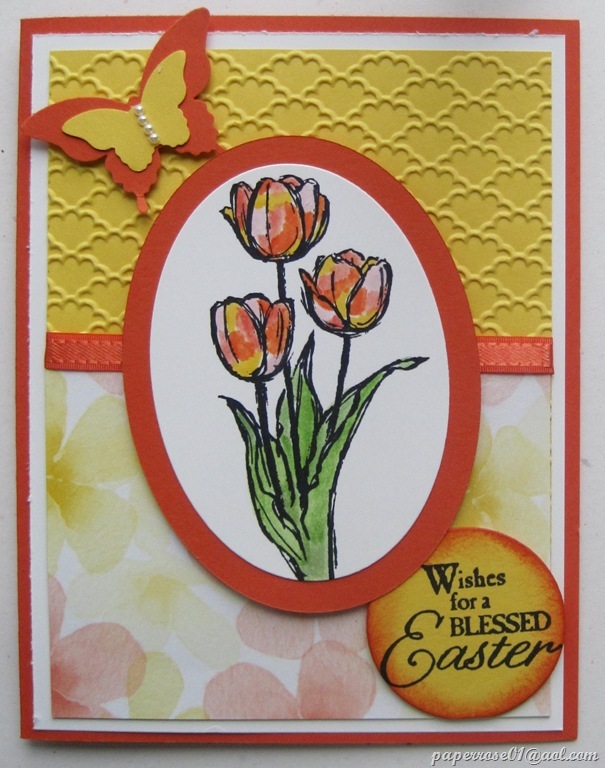 “Blessed Easter” is the stamp set featured on this card. The color scheme is Tangerine Tango and Daffodil Delight . The tulips are water-colored with blender pens and an assortment of inks. The Fancy Fan Embossing Folder provides texture to the top part of the card, and the beautiful Watercolor Wonder Designer Series Paper adds softness to the card. I absolutely love the Watercolor Wonder DSP. Deb added a bit of Tangerine Tango ribbon, and a double butterfly using the Elegant and Bitty Butterfly Punches. We split the message from the main stamp so we could use the tulips for other occasions. Deb stamped the message on Daffodil Delight, cut it out with the Circle Framelits, and then sponged the circle heavily in Tangerine Tango. This beautiful card will be one of the four we will be completing at our April Stamp Camp. Dates/times are: Thursday, April 3rd from 2 – 9 PM; Friday, April 4th from 2 – 9 PM; and Saturday, April 5th from 9 AM – 4 PM. If you need another date/time, please let me know, and I should be able to accommodate your request. On a personal note, many of you are aware of weight loss surgery I had in October 2013. I am proud to report that I have lost over 90 pounds, and am fast approaching 100 pounds. Still have more to lose, but I am feeling a sense of accomplishment! Remember that Sale-A-Bration ends March 31st. Let me know if you want to take advantage of this annual sale.